One of the questions that I receive more often than not is what kind of polymer clay tools that I use in my studio. The honest truth is, I have so many that I honestly don’t know where to start … so you will get several different “polymer clay tools” posts so that you can learn what you might like, based on what I like. The truth is that what tool I use depends on what I’m working on as to what tool I use. This being said, I will give you a brief synopsis of the tools that I use everyday or almost every day and let you know what I think of them. So … let’s see what polymer clay tools I use, shall we? Isn’t that a great picture? 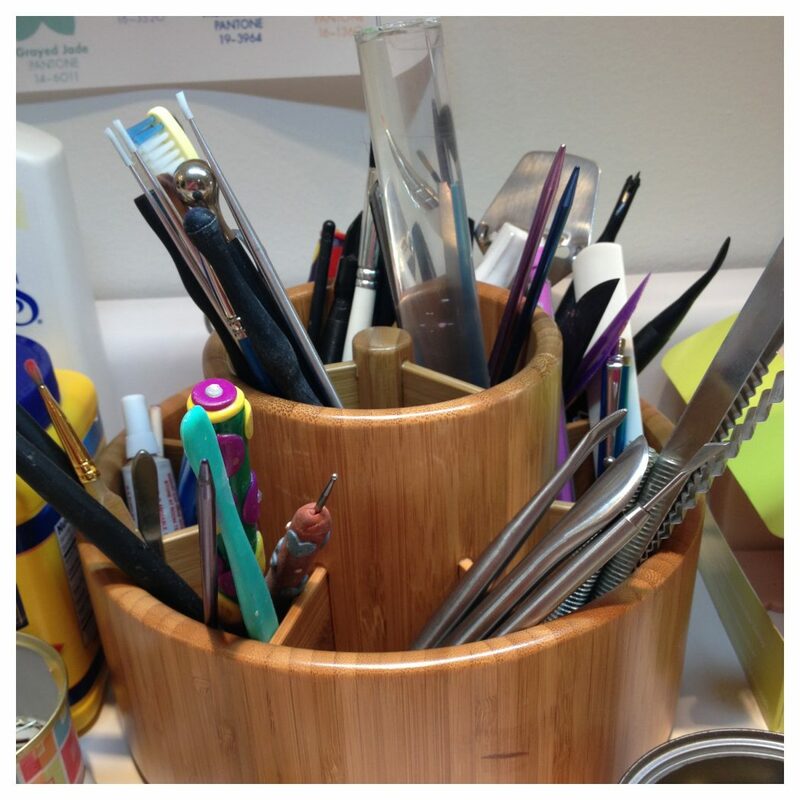 This was a Christmas present from my Mom, it’s a Pampered Chef Bamboo Utensil Caddy for your kitchen. Who needs it in the kitchen? The studio – yep, that’s exactly where it goes. There are tons of little daily tools in here, but today I’m going to discuss my favorite polymer clay tools that I use on a daily or very regular basis. I don’t do much conditioning of my clay by hand, I do 90% of my clay conditioning through my pasta machine. I have an Atlas 150 and it is the BEST pasta machine that I have ever had! I use my pasta machine for conditioning, blending, and so much more. This is definitely a must have (in my opinion) if you are going to be doing a lot of claying. However, it is NOT a requirement if you are a sculptor (like me) as most of our creations do not need a pasta machine. EDIT: I have upgraded to a LC Machine and it is by far better, but not necessary for a hobbyist clayer. Please read the review here. The first time I told my husband that I call these my “dotters” he thought I said “daughters.” Alas, this is where the written word proves more powerful. I use these embossing tools for everything! I use them to smooth clay seams, add detail, and even to pick up clay from my work surface and put it on my piece. The set you see at right is a variegated size set. I have 3 different sized “dotters” that I use for different projects. I literally could NOT get through a day in my studio without reaching for my polymer clay embossing tools. If you have never tried these, it would be a great help to you! I promise. Previous post: Friesen Friday Project: Starfish & Seahorses! Hi dear, please let me know if the pasta machine will work on air dry clay. Disabled senior with shoulders that just cannot handle a rolling pin. Thank you! Hi Patricia, yes, it should work just fine. However, I would place your clay between deli paper or waxed paper or it will stick to the rollers very badly. A needle tool and this pointy-tipped tiny foam paintbrush. It’s actually made to paint faces on dolls, but I use it as a blending tool. Works great! Oh, and my x-acto knife. Can’t live without those three.